HAIT’s simultaneous interpreters are carefully selected for their advanced language, interpersonal and professional qualities. Many have advanced degrees in interpretation, linguistics, or a particular language, and have highly specialized subject matter knowledge. This level of expertise allows us to source the right linguists and provide the most effective simultaneous interpretation for your event. HAIT provides simultaneous interpretation, conference discussion equipment and assistive listening devices in one package. 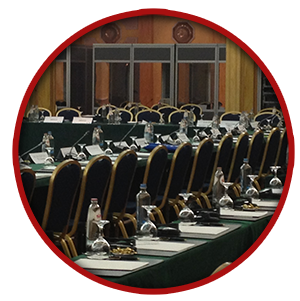 Our highly competitive pricing and exceptional project management skills, we can be your one-stop-shop for conferences, lectures, meetings or special events. In addition to the services of our highly qualified interpreters, we provide the required special equipment for interpretation such as soundproof booths, state-of-the-art interpreter’s consoles, high-quality microphones with push-to-talk features designed as an economical solution for optimizing sound quality to enable participants to communicate clearly in turn regardless of the facility’s layout, and portable digital receivers and transmitters ideal for assistive listening. Generally used for large conferences or meetings and/or environments where two or more languages are required, simultaneous interpretation is a complex and strenuous process. Interpreters sit in an isolated booth, listen to the speaker through a headset, and speak the translation into a microphone, which is wirelessly transmitted to headsets worn by audience members. Sometimes referred to as U.N. style interpretation, this service requires trained interpreters and specialized equipment, all of which can be provided by HAIT. Commonly used in one-on-one or small group settings, our consecutive interpreters maintain strict standards of professionalism and possess exceptional linguistic and interpersonal skills to help facilitate interactions between two (and sometimes more) languages. In Whispered or Chuchotage Interpreting the interpreter translates at the same time as the speaker and does not require any special equipment. This kind of interpreting is suitable for very small groups (e.g. Tours), but is, however, no substitute for simultaneous interpreting as the original speaker and the interpreter speak at the same time. This can lead to some unavoidable disturbance. As whispered interpreting requires as much, if not more, concentration as simultaneous interpreting, it is necessary to have two interpreters present per language. Quality is the most critical aspect of interpretation services. and we, here at HAIT, have developed a quality assurance (QA) process for ensuring professional interpretation standards that are based on a collaborative, customer-driven model of continuous improvement. Our process is based on industry best practices and leading research on interpretation standards. But we don’t stop there; we actively seek client feedback and use your responses to enhance our process further. This results in continuous improvement of our already high-quality interpretation services, based on your requirements. Combined with our customized engagement models, personalized service and rare language support, the result is high quality professional interpretation services that will continue to meet your exacting standards and evolving needs.